I had a good weekend of rock climbing, running and Mtn biking. On Friday night, I went to the Triangle Rock Club for some top roping with friends. Lucky for me, Monica and Alix were patient enough to show me how to belay again and I am again confident in my belaying abilities. I did five 5.7+/- climbs which was way more than I expected to do. Every other time I've been there I quit at 3 or 4 because I get tired and my arms get all pumped. It was fun, more fun than I expected. Afterward we attempted pull-ups, kettlebell swings and toes to bars in the little gym there. Saturday morning was running Company Mill and it just sucked. I had no energy and had my slowest time ever- 1:15 for 5.5 miles. Lisa and Edward did much better than me and both had a good run. I did get to meet a fellow mountain biker on this run though so that was great because we talked about how fun mountain biking is and which trails to go on. Later that day, I biked Crabtree and did two things I haven't been able to do: a mini rock garden on Loop 1 and the rock ledge on loop 3. I'm hoping to try both again tonight. Sunday was supposed to be a ride at Carolina North Forest (CNF), but it was closed due to rain so we rode 286 instead. That trail keeps getting longer and longer. Much fun but I was sweating buckets due to the high humidity. All in all a pretty great weekend of getting outside and out of my comfort zone (climbing). 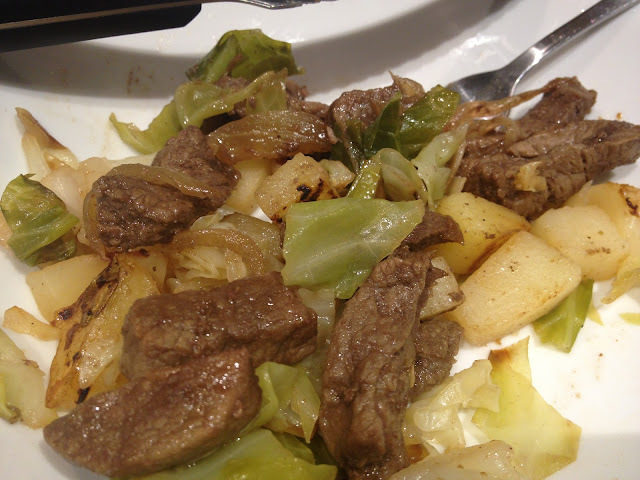 Food wise- I've been pretty good and made a new meal last night of cabbage, potatoes, and angus beef chuck steak. Now I need to lift some heavy weights to balance all the cardio.